Clearwater Beach, the Best Beach in America, is known for its soft white sand, beautiful sunsets, and delicious food! Being on the Gulf of Mexico, one of the best things to order is the grouper sandwich. Frenchy’s Original Cafe opened in 1981 and quickly became known for their fresh grouper sandwiches. Frenchy’s doesn’t just offer a great Grouper Sandwich, it offers a variety of types. The Original Grouper Sandwich, a fresh grouper filet friend in a seasoned batter. Super Grouper Sandwich, just as delicious just even more! You can also choose from grouper sandwiches, grilled, Cajun, Buffalo or even a unique Grouper Reuben! 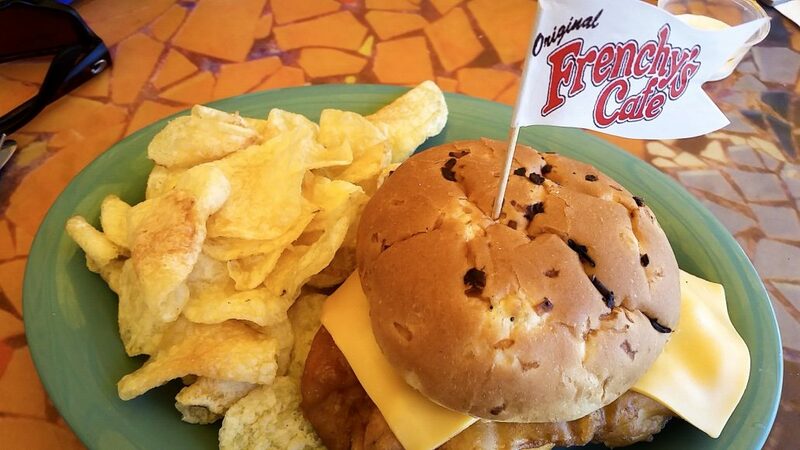 Frenchy’s grouper sandwich is the delicious food that built Frenchy’s Clearwater Beach empire. Head to Palm Pavillion Beachside Grill & Bar and enjoy a grouper sandwich directly on Clearwater Beach – not just the island, sitting on the beach itself! You’ll find a lot of grouper on the menu including three different grouper sandwiches. I almost always order my grouper sandwich fried, except at Cooters. I’ve tried it every way and had to agree with them – the blackened grouper sandwich had the best flavor at Cooters. Crabby’s Dockside, located across the street from Pier 60, has a delicious grouper sandwich. Choose how you’d like yours made; fried, grilled, blackened, or broiled! Clear Sky Cafe is known for their delicious Clearwater Beach breakfasts and Bloody Mary Bar. They also have delicious dinner food including their grouper on brioche. Choose from grilled, blackened, fried or even piccata. Blinkers Beachside Steakhouse and Lounge offer a great combo of Steak and Seafood. Their grouper sandwich comes lightly breaded with lettuce, tomato, preserved lemon tartar, toasted bun and a side of fries. Sandbar, located in Opal Sands Resort, is known for its absolutely delicious fish tacos right on the edge of the Clearwater Pass. They offer more than just fish tacos, they have a fantastic menu that includes a great grouper sandwich. Sparky’s, a great beach bar on South Clearwater Beach, has a great menu including a grouper sandwich that can be made grilled or blackened and served with lettuce, tomato, onions and tartar sauce. Tate Island Grill is located on the edge of the Sandpearl Resort touching the white sand of Clearwater Beach. They have a large menu featuring appetizers, salads, wraps, burgers, sandwiches including a traditional grouper sandwich and more!